While every restaurant had long snaky queues outside the shop and even the food court were fullhouse, we noticed that mookata is the best solution for us to have our dinner fix as there was no queues at all. 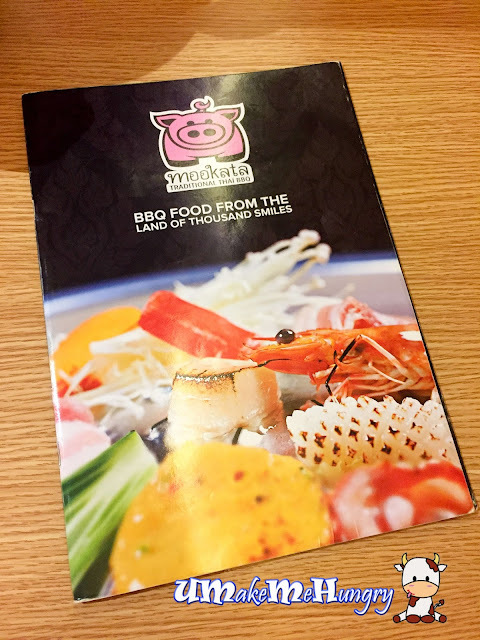 Mookata is nothing new to us as we have seen lots of neighbourhoods restaurants and coffeeshops offering such cuisine. 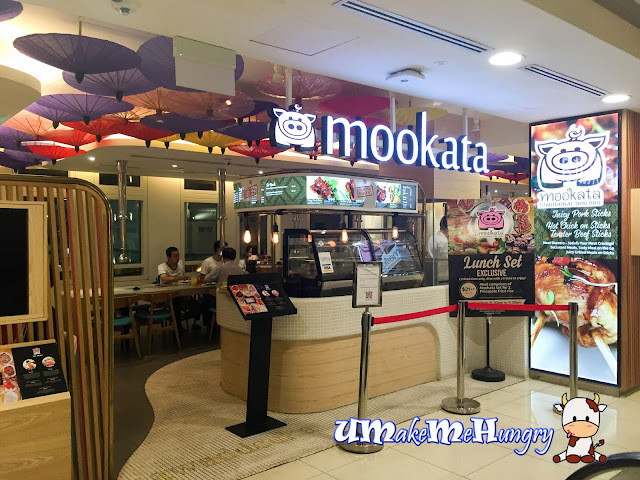 However Mookata in Bugis Junction is rather new to me as I don't remember seeing such a shop. Interior was spacious and with dining tables by the side of the restaurant, leaving the middle a wide area for easier movement. 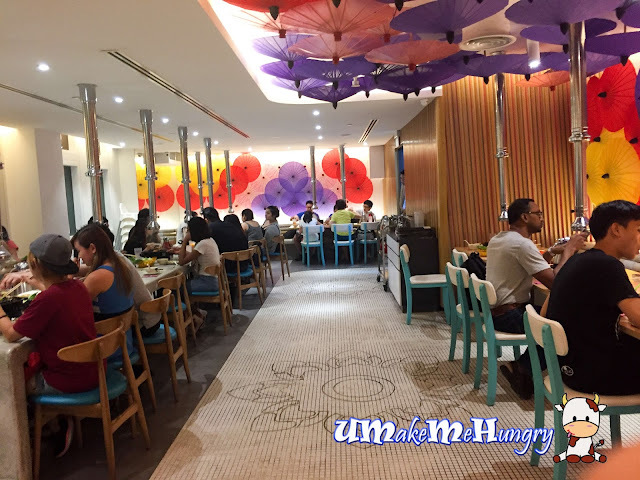 Decorations in dining area was unique with wooden colorful umbrella hanging upside down. 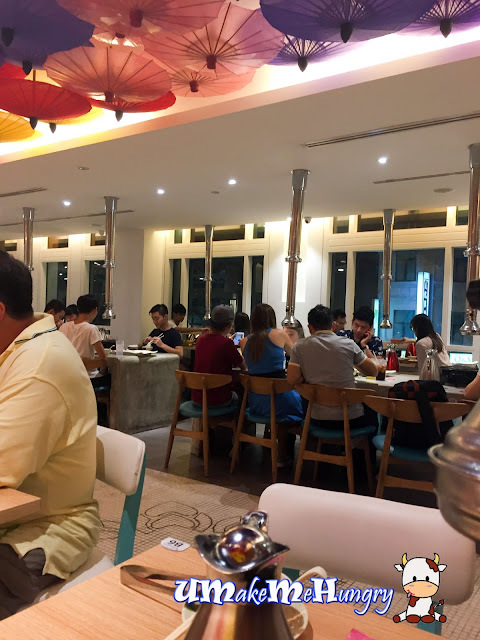 Interior is rather modern and does not have any resemblance in the Thai Culture. Each table comes with a ventilator hanging from the ceiling that helps in absorbing the BBQ smoke. 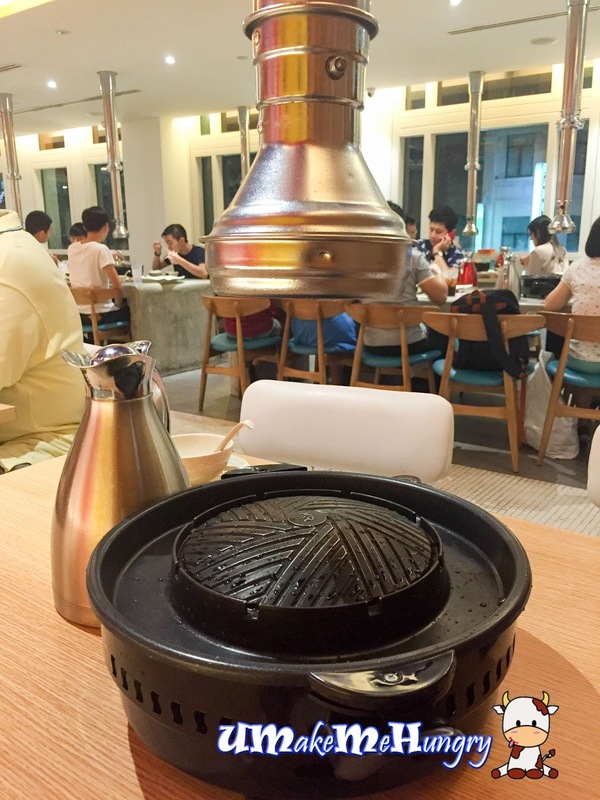 Upon Ordering, the helpers switched on the electricity and let our Mookata pot warms up. A flask of sweet corn soup stock was also provided. 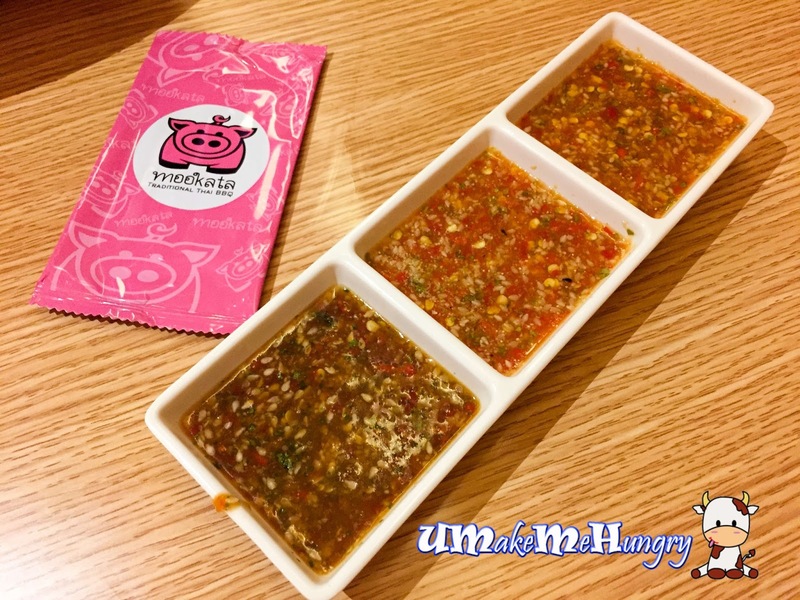 What I like about their Mookata is their 3 versions of chilli from non spicy, mild spicy and spicy. Set for 2 was a straight forward and fuss free order. 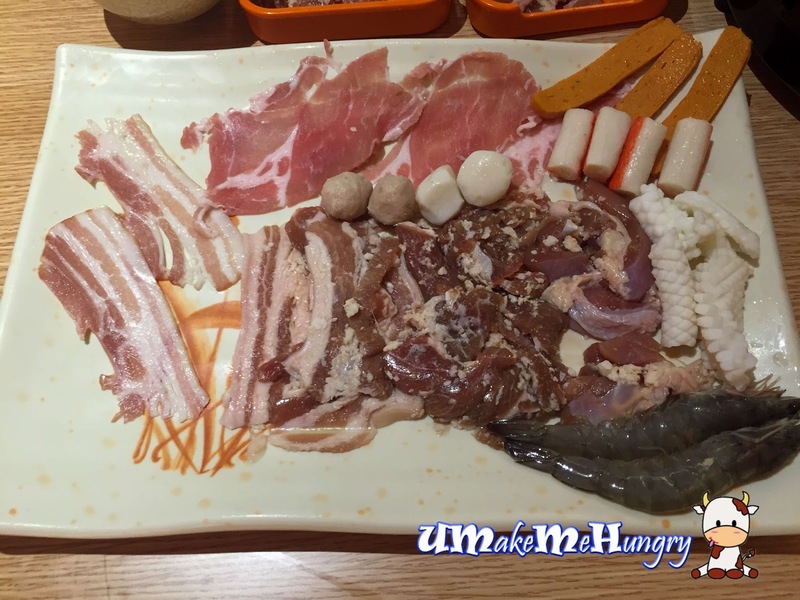 It consists of a combination of marinated chicken thigh, pork collar, prawns, squids, suriyaki, streaky bacon, fishballs, pork belly, meatballs, crabsticks, otah fishcakes, Chinese cabbage, kang kong, xiao bai cai, corn, golden mushrooms, eggs, tang hoon & tofu. 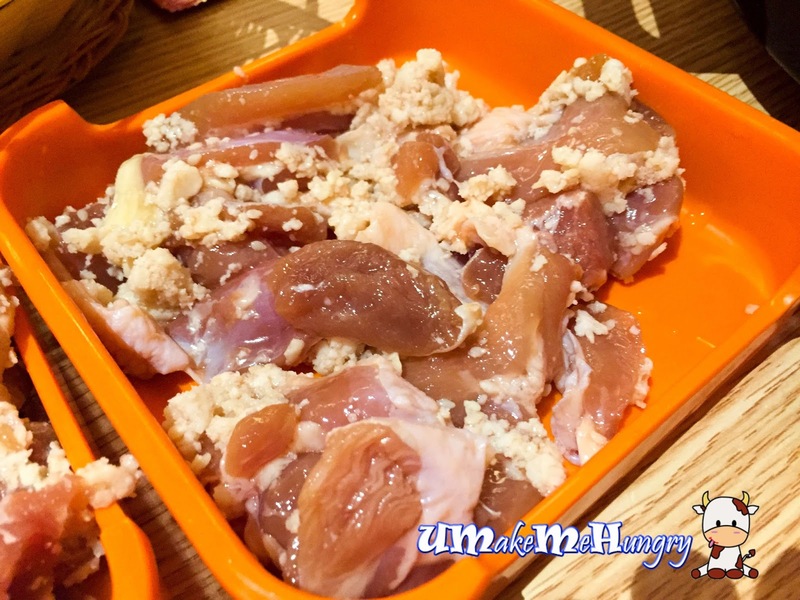 Looking at the amount of meat on the set, we find that the portion was quite little for us and we decided to top up some of the meat portion.Marinated meat was served in orange tray form which can be stacked up together. The meat was absolutely fresh and well prepared. We poured some of the soup from the flask into the moat surrounding the skillet. The soup was light in taste but sweet. It allowed the essences of grilled meat juice that was placed on top of the skillet to flow down and mix with it to obtain a rich and flavourful soup. 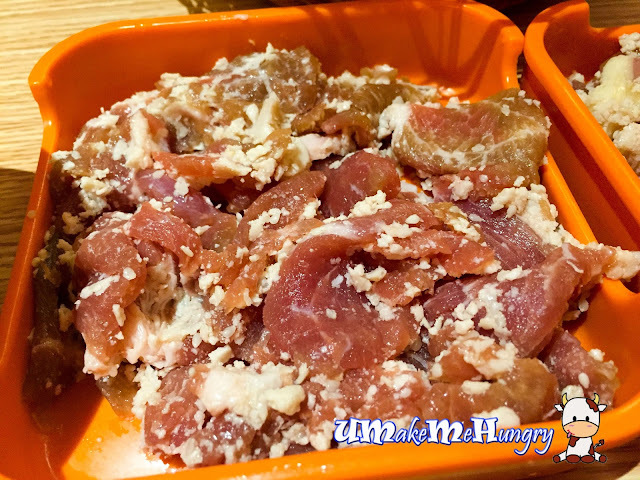 For additional taste, you may opt to have your vegetables and other items mixed in too. 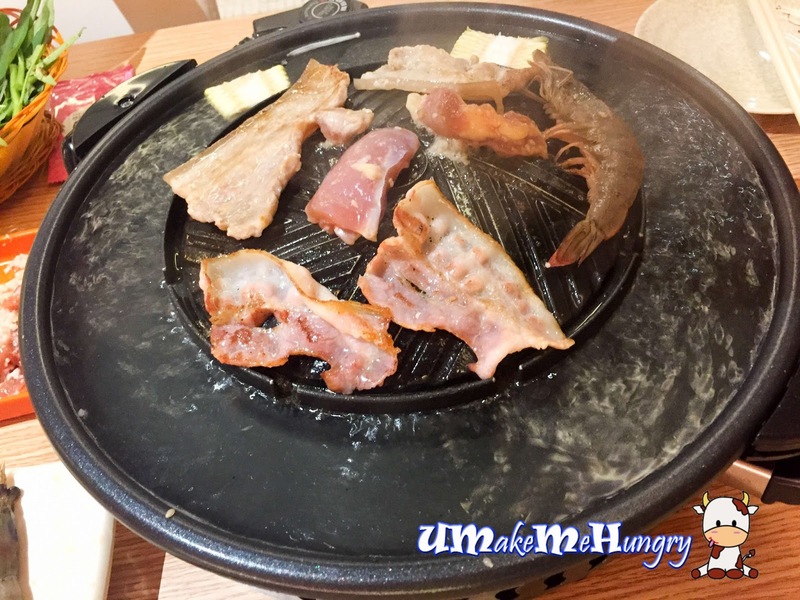 One good point to take note is perhaps not to pour too much of soup into the pot while you have your grilled items still lying on top of the mookata as the juices will shoot directly onto your hands or faces. I enjoy Mookata even it may cause me smelling like a walking BBQ food item after the mookata session and with the smell clinging onto the hair that gets away after a few wash.